This is a specialist cabinet primarily designed for bi-amplified systems, although it is perfectly usable full range, when the built in passive crossover protects the 10" treble speaker. The main feature of the sound is the extreme frequency range, from ultra deep bass to crystal clear high frequencies. Depending on the chosen bass sound and style of playing, the 1818X offers a subtly richer sound than the single 15" or 4x10" cabinets. 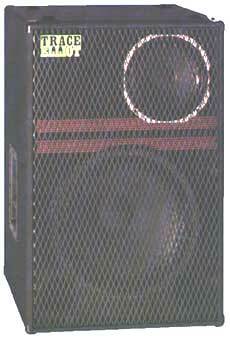 Single 18" bass speaker and special high frequency 10" speaker with built in crossover. Nominal power handling is 200 watts full range and the nominal cabinet impedance is 8 Ohms. Ideal match to GP11 150 watt amp head. bass 200 watts (8 Ohms), treble 150 watts (16 Ohms).